Richard Murakami has been volunteering at JANM for 21 years and documenting the museum’s history for almost as long. He doesn’t claim to be a photographer or even in charge of JANM’s corps of volunteer photographers; rather, he prefers to think of himself as the museum’s event photo coordinator and librarian. It all started in 1994, when Richard attended the members’ opening reception for America’s Concentration Camps: Remembering the Japanese Experience and noticed that no one was taking pictures. With a Canon camera that he’d brought from home, he began shooting. He then had two sets of photographs printed and gave the prints and the negatives to JANM for the purpose of starting a repository of images of this type. This task that he saw as a necessity soon grew into his main role and contribution to the museum. 522nd Service Battery personnel, near Rosignano, Italy, 1944.
the exhibition Before They Were Heroes: Sus Ito’s World War II Images. Some of the volunteer photographers (Steve Fujimoto, Russell Kitagawa, Gary Ono, Richard Murakami, and Richard Watanabe) recently sponsored the Upper Level Members Reception for the opening of Before They Were Heroes: Sus Ito’s World War II Images, an exhibition of photographs taken by Ito while he was on a tour of duty through Europe as a member of the 442nd Regimental Combat Team. The reception was a natural fit for the group since the exhibition is about photography, but for Richard, it was also about honoring the 442nd veterans. “They opened the door for people like me who followed, so I owe them a lot,” he said. This post was researched and written by JANM Executive Assistant Nicole Miyahara. In addition to her duties at JANM, Nicole is an ethnographic documentary filmmaker who is currently working on The Making of a King, a documentary that explores the world of drag kings, the lesser-known counterpart to drag queens. This week, JANM opened Before They Were Heroes: Sus Ito’s World War II Images, the first exhibition in Sharing Our Stories, a new series drawn from JANM’s extensive permanent collection. 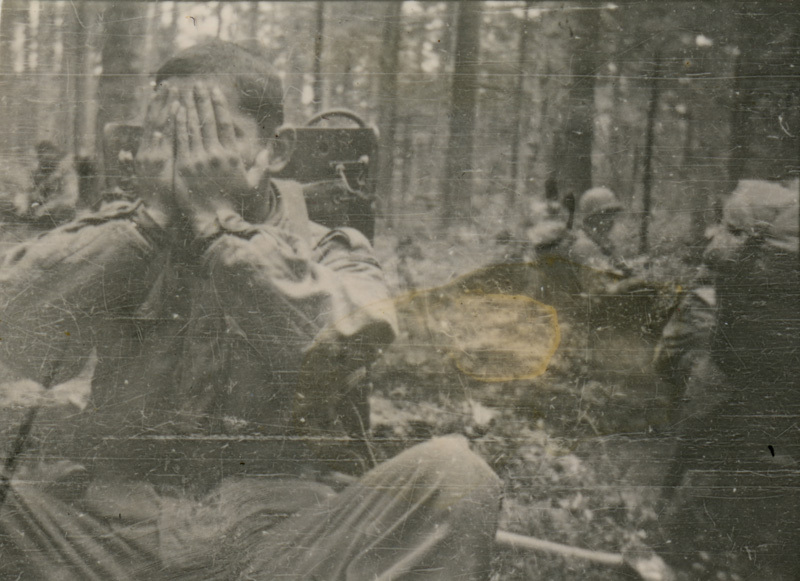 The exhibition looks at WWII photographs taken by Susumu “Sus” Ito while on a tour of duty through Europe as a member of the 442nd Regimental Combat Team’s 522nd Field Artillery Battalion. While Ito participated in such dramatic events as the rescue of the Lost Battalion and the liberation of a sub-camp of Dachau, the majority of the photographs capture the humble daily lives of a group of young Japanese American soldiers. In the essay below, JANM Curator of History Lily Anne Yumi Welty Tamai, PhD, takes an in-depth look at one of the images featured in the exhibition. Read on for a riveting account of the rescue of the Lost Battalion and its aftermath, as experienced by soldiers who lived through it. “We were in a number of dangerous situations. But the five days that I spent with ‘I’ Company and this mission, were really the most memorable. It was five days where I didn’t remember days from nights.” —Sus Ito, from JANM oral history interview, 2014. 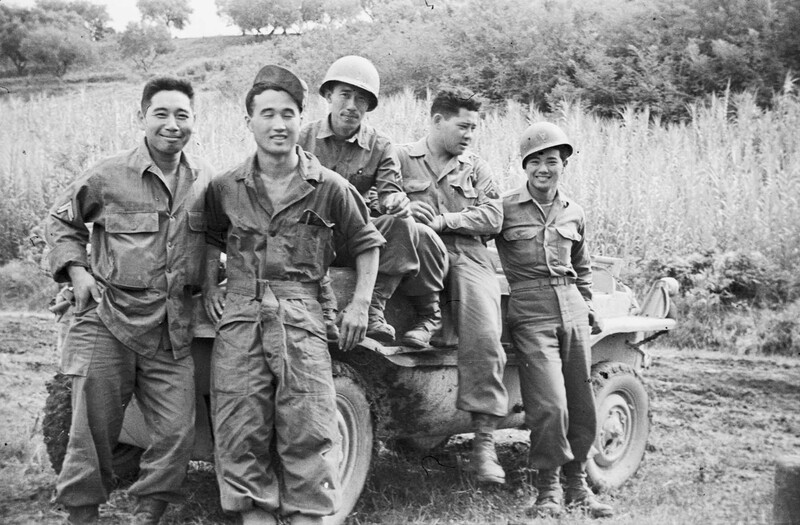 In the last week of October 1944, after ten days of fighting to liberate Belmont, Biffontaine, and Bruyères in northeastern France, the segregated all-Japanese American 442nd Regimental Combat Team received new orders. Without rest or time to recuperate, they were sent on a mission to rescue the 1st Battalion of the 141st Infantry Regiment, made up of men from Texas. 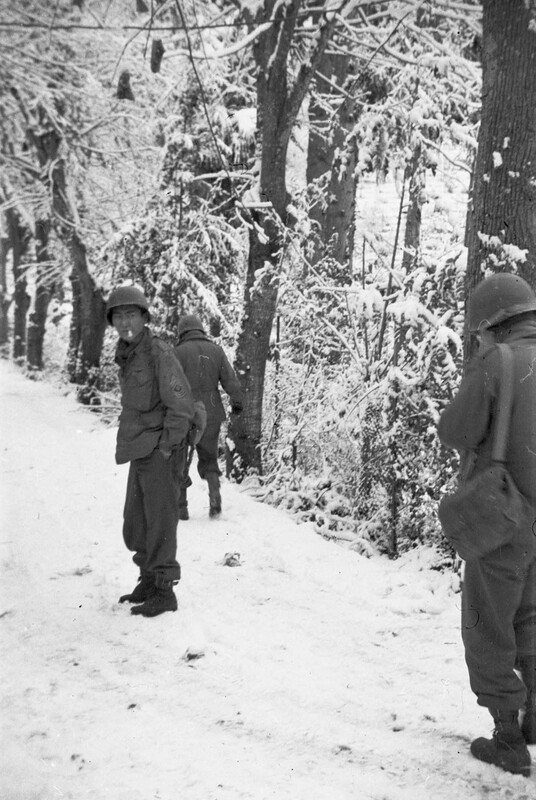 The soldiers of the 141st were trapped behind enemy lines and surrounded by German troops in eastern France with very little food, water, and medical supplies. Two other units had tried to rescue the so-called Lost Battalion without success; the Germans had a tremendous advantage in terms of position, and ambushed the American troops from their sniper nests. There were no real roads in the mountains, just trails, and most were too narrow for large tanks. The forest was so dense in some areas that they had little to no visibility. Veteran George Oiye of the 442nd’s 522nd Field Artillery Battalion, “C” Battery, remembered the conditions: “The rain, snow, heavy clouds, dark fog, and the huge carpet of pine trees overhead made it hard to tell day from night.” It took six days of intense fighting to rescue the Lost Battalion. 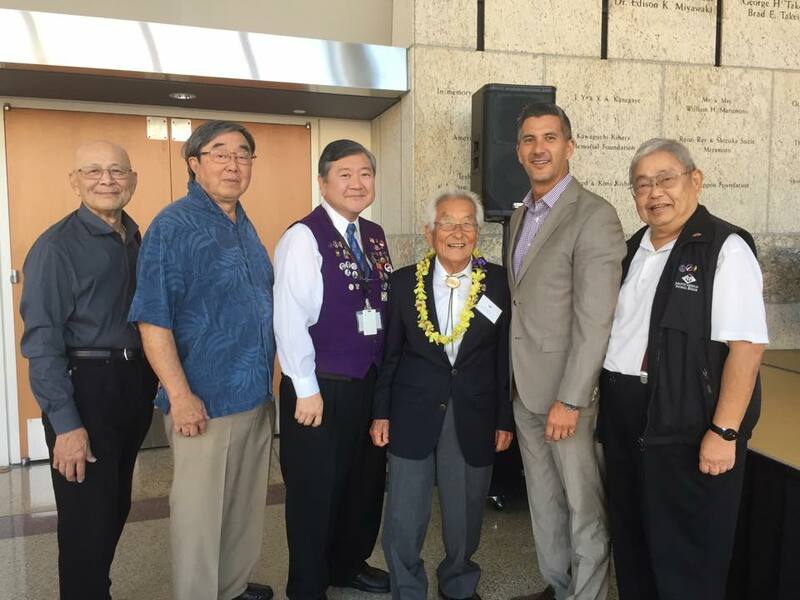 Out of the 800 Nisei soldiers who fought, around 600 suffered casualties in the process of rescuing 211 men. “I saw so many wounded and dying fellow soldiers. There were friends holding their comrades in their arms. I ran into ‘I’ Company, which at that point only had four guys with a PFC (private first class)—Clarence Taba—in charge … the fighting had been that fierce.” —S. Don Shimazu, veteran of the 522nd Field Artillery Battalion, Headquarters Battery. General John Dahlquist had sent the Japanese American unit on this mission knowing the odds for success were slim. Years later, as told in the book Japanese American History (edited by Brian Niiya), U.S. Senator and 442nd veteran Daniel K. Inouye recalled: “I am absolutely certain that all of us were well aware that we were being used for the rescue because we were expendable.” Despite these circumstances, they all fought valiantly. Sus Ito did not take many photographs during the actual rescue of the Lost Battalion. However, he did take one of Sgt. George Thompson (above) after the battle was over. Thompson was not even supposed to fight on the front lines, but he had begged Ito for an assignment so he could see what war was really like. Ito agreed, allowing George to carry an extra set of radio batteries for the unit. To hear more of these stories and learn more about our exhibition, be sure to catch Dr. Lily Anne Tamai’s Behind the Scenes Lecture on July 25. The program is free with museum admission, but RSVPs are recommended here.